Win 50 Gift Bags in Celebration of our One Year Anniversary! 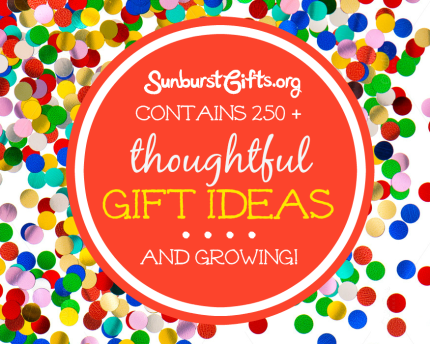 Last Thanksgiving, Queen Darlene and I launched Sunburst Gifts with the goal of making the world a happier place one thoughtful gift idea at a time. After jumping into the blogging world with both feet in (not knowing exactly where we would end up), we’re so happy we took this risk! We’ve even expanded and recently launched our gift consulting service just in time for the holidays where after we learn the exact gift giving needs of clients we provide them with three custom thoughtful gift idea proposals. The support we’ve received from family and friends during the past year motivated us to continue week after week. Thank you to everyone who expressed to us they liked or used our gift ideas, who subscribed to our blog, who liked and shared our Facebook posts, and who provided us with gift ideas to use. And thanks to YOU our loyal readers. You’re a part of our journey here at Sunburst Gifts, and you played a part in getting us to our one year anniversary! In celebration of our one year anniversary, Queen Darlene and I are giving away a Huge Collection of 50 Gift Bags. It’s our thoughtful gift to the lucky winner to save them from hours of wrapping presents! For the giveaway, we’re using Rafflecopter.com since it gives you multiple chances to win our Huge Collection of 50 Gift Bags. We will announce the winner Monday, December 8, 2014! Happy thanksgiving to you and yours, and we hope you enjoy the thoughtful Christmas gift ideas we’ll be sharing with you over the course of the next month. 50 Gift Bag Collection Giveaway! Homepage » Catch All » Win 50 Gift Bags in Celebration of our One Year Anniversary!